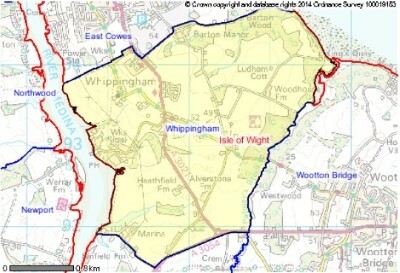 After many years of requesting a Parish Council for Whippingham this finally only came into fruition in May 2008 when Whippingham elected its first Parish Council. This also completed every part of the Island having a Parish or Town Council. There are just under 500 households in the electoral area of the Parish Council which is made up of the village of Whippingham, Barton Manor Estate and surrounding area and also includes part of Island Harbour. The village school that was closed by the Isle of Wight Council a few years ago is now occupied by Priory School who's students take a great interest in our village. We also have a lovely local pub on the banks of the river Medina called "The Folly" and it serves up delightful meals. We lost our village post office and shop when our long serving post mistress retired but we have been lucky to get a mobile post office service back into the village for 3 days a week which is very much appreciated. The hub of our village is Whippingham Community Association's Hall that is run by a dedicated group of people. The hall is used for a vaste range of activities by many groups, clubs and individuals. Whippingham is best known for its connections with Queen Victoria especially Mildred's Church which was redesigned by Prince Albert. The village became the centre of the royal estate supporting Osborne House and Barton Manor. The farms, school, almshouses, forge and cottages were rebuilt when they became part of the Queen's estate and Prince Albert had a 'model farm' built at Barton. Queen Victoria took a close interest in 'her people' in Whippingham, providing for them in sickness and in health. St Mildred's Church is the Church of England Parish Church. Its close connection with Queen Victoria is reflected in the many memorials in the church which commemorate members of the Royal Family and the Royal Household. A side chapel is dedicated to the Battenberg/Mountbatten family. Whippingham played an important part in the second world war as the SARO Works were located down Folly Lane on the banks of the River Medina. Saro Works were part of Saunders-Roe.